The next time you reach for a sweetener, reach for honey! Use honey in place of table sugar in your tea or coffee. Instead of using jelly, drizzle honey onto peanut butter for a peanut butter and honey sandwich. Drizzle apple slices with honey and sprinkle with cinnamon. 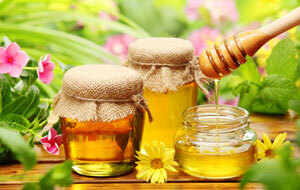 Did you know that honey can be used in place of sugar in most recipes? Honey do!